Edward Zwick has directed and/or produced a diverse group of movies. On his resume, you'll find the popular TV drama/comedy "thirtysomething," the romantic comedy Shakespeare in Love, the gritty crime/drug drama Traffic, and the child-custody/mental-retardation drama I Am Sam. But although his movies are varied, Zwick has come to be associated with epic tales that involve war, as in Legends of the Fall and Glory (the latter is possibly his highest regarded directorial effort). And it's in Glory's battle sequences that Zwick has left his strongest impression. Regardless of what you think of the rest of Zwick's body of work, it's the magnificently realized battle sequences from Glory that most likely first come to mind when the name Zwick is mentioned. His newest film, The Last Samurai, allows Zwick to return to the war genre but with a major difference. Now Zwick commands hundreds of Samurai warriors as if he were Akira Kurosawa. Much of The Last Samurai feels familiar. It's like a combination of Dances With Wolves, Glory, and Seven Samurai. Much like Kevin Costner in Dances With Wolves, here Tom Cruise becomes disaffected with life in the army. Placed far from home (the American West for Costner and Japan for Cruise), Cruise gradually becomes seduced by the simple lifestyle he encounters among the warriors (Indians for Costner and Samurai for Cruise) who occupy the land against insurgent rushes of civilization. In both cases, possible mates for the heroes emerge. In The Last Samurai, however, there is a much greater emphasis on war. Costner wasn't particularly interested in war, only it's outcome and how it affected the participants. Zwick is drawn in by the wonderful sense of tradition and the intense dedication exhibited by the Samurai, so as a result of that fascination, he spends a considerable amount of time on the battle sequences. These are some of the most detailed and elaborate military confrontations since Kurosawa's Ran. 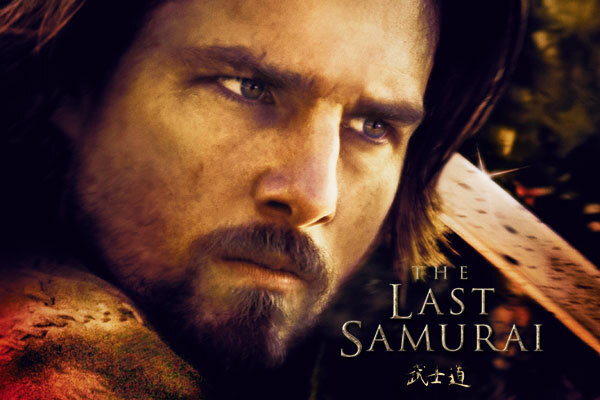 But lest I get too carried away discussing The Last Samurai as an Edward Zwick movie, make no mistake about it: this movie is first and foremost a Tom Cruise movie. He's in virtually every scene. He's our eyes and ears as the movie reveals to us Samurai culture, and it's through our attraction to Tom Cruise and our concern over his plight that the movie succeeds or fails. As such, the movie takes pains to set him apart; he gets his own colored coded samurai armor for the big climactic battle sequence at the movie's climax. And while the armor suit has a helmet, Cruise forgoes the helmet so that we can get an unobstructed view of his face. After all, people are shelling out hard earned cash to "see" Tom Cruise -- not to see his face concealed by a confining helmet. Cruise plays Captain Nathan Algren. As the movie opens, he has become a drunkard who showcases his sharp-shooting ability during a traveling exhibition for Winchester Rifles. In the not so distant past, his prowess on the battlefield was renowned, but his role in the Indian Campaigns, where he saw many Indian women and children massacred, has left him disillusioned and bitter. When advisors for the Emperor of Japan come calling, attempting to enlist Algren to help them train Japan's first modern, conscript army, Algren laughs in their faces and walks away. But he's ordered by his superiors to go to Japan. There he attempts to mold farmers into soldiers. It's a long process that the Emperor's advisors have little appreciation for. They rush the soldiers into battle against the Samurai, who ostensibly serve the Emperor and country, but they are a living anachronism, now considered rebels by the state. The skill of the Samurai on the battlefield is legendary. They promptly rout the soldiers, leaving Algren to fend for himself on the battlefield. Surrounded by Samurai, he continues to fight, refusing to give up. His determination impresses the Samurai's leader, Katsumoto (Ken Watanabe), and he spares Algren life - not out of compassion but through his desire to learn more about this new type of enemy. By understanding Algren, Katsumoto will be better equipped to defeat him - and men like him - on the battlefield. So he orders Algren captured and taken to the home of the Samurai, far away in the hills. Unlike Dances With Wolves where the storytelling depends upon Costner's characterization in order for a story to exist, The Last Samurai doesn't necessarily need Cruise. There is still a story here, involving Japan's growing infatuation with Western ways and what this means to the Samurai who lived by a code of conduct (the Bushido) several hundred years old. The main reason Cruise's character exists is to give Westerners -- who might not be convinced to see a movie with Japanese characters -- a character they can identify with. Therefore, Cruise exists not so much because of the demands of the story as because of the demands of the Western audience. It's a crucial difference between Dances With Wolves and The Last Samurai. And it contributes to some of the movie's weaknesses, such as the final scene, where through Cruise's presence and the feats that Algren has accomplished, the young Japanese emperor finally takes a stand against the forces that have Westernized his country. At this point, the movie needs to soar, but instead it stumbles badly with mechanical, predictable dramatics. If you don't mind the blatantly Westernized viewpoint, The Last Samurai is a frequently impressive movie. Zwick is marvelously talented at crafting battle sequences. In particular, the Japanese army's initial confrontation with the Samurai stands out. This scene takes places deep in a forest. Shafts of light backlight the Samurai, making them appear as mythical, dreamlike creatures. They ride forward on their steeds, the fantastic contours of their armor making them appear monstrous. The Japanese soldiers -- freshly outfitted in uniforms and bearing firearms that they barely know how to load let alone fire -- quiver and then run. It's a genuinely chilling sequence of chaos and confusion. The movie's real core then becomes the confrontations between Cruise and Watanabe, the samurai chief who wants to understand his enemy so that he can better defeat him in battle. And this is what sets the movie apart from Dances With Wolves. It's about the confrontation between these two great military tacticians and what they learn from each other. Unfortunately, the scale of learning is largely tilted toward Algren/Cruise. The movie somehow loses sight of Katsumoto/Watanabe, who seems to learn very little in this exchange of ideas. This is another Western conceit, that the representatives of the West have a much greater capacity for learning. And with this conceit, the movie drifts further and further into a fantasy world, with the Samurai treating Algren as if he were a demi-god, bowing to him as he rides across their land. But there is still much to appreciate in The Last Samurai. Cinematographer John Toll has provided some truly stunning images. He's practically a shoe-in for the next Academy Award. And production designer Lilly Kilvert has created a wonderfully convincing sense of place, including an American frontier town, crowded Japanese streets, and a secluded Samurai village. This is a gorgeous movie with a magnificent epic sweep. In addition, The Last Samurai contains what may well be Cruise's best performance. He makes us empathize with Algren and understand his intense self-hatred, and through Algren's cynicism, we come to like the man and appreciate his regeneration. That's no small feat for any actor to accomplish. The Last Samurai never quite achieves the greatness promised by its sumptuous visuals, but at times it comes mighty close. Studio Web site: Warner Bros.
Photo credits: © 2003 Warner Bros. All rights reserved.